We’ve analyzed the records, completed all the calculations, and researched all of the district tie-breakers. The result is this complete narrative of the district playoff scenarios for every district in the state – all classifications. District 1 – KC Piper has already clinched the district championship with wins over Basehor-Linwood and Tonganoxie. The winner of the Bobcats and Chieftains this week will determine the district runner-up. Atchison had a nice season posting six wins, but will fall short of the playoffs. District 2 – Top-ranked Bishop Miege has clinched the district title with wins over Louisburg and Spring Hill. The Stags will be heavily favored at KC Sumner this week. The winner of the Louisburg game at Spring Hill will advance to the playoffs as the district runner-up. 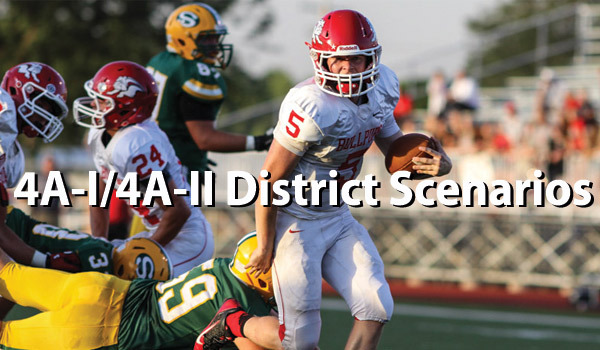 District 3 – De Soto is the only team that has been eliminated. The Wildcats would need to beat Ottawa and have Baldwin lose to Eudora to force a three-way tie at 1-2 for the runner-up spot. But even then, De Soto could only finish as good as -7 in the points tie-breaker, while Ottawa can finish no worse than -3. Eudora can clinch the district title with a win. Should the Cardinals lose to Baldwin and Ottawa wins, both playoff spots would be decided by the top two finishers in district points. Baldwin needs to beat Eudora by at least 12 points to secure a playoff spot. District 4 – The winner of the Fort Scott and Paola game this week will qualify as the district champion, while the loser advances to the playoffs as the runner-up. District 5 – All teams are still eligible for the playoffs, but Augusta has qualified for the playoffs for the first time since 2009. The Orioles could lose to Independence this week and still remain in the top two teams in the district points tie-breaker should Coffeyville also win. The Golden Tornado can clinch a playoff spot by beating Winfield and can claim the district title with a 6-point win coupled with a win by their arch-rival Independence over Augusta. Winfield must beat Coffeyville by 21 or more points and hope for an Augusta win over Independence to get in as the runner-up. Meanwhile, Independence is the district champion with a win and a Coffeyville loss. District 6 – Topeka Hayden has clinched the District 6 title with wins over Andover Central (51-21) and El Dorado (49-20). The second playoff spot will be filled by the winner of the Andover Central game at El Dorado. District 7 – All four teams are still able to qualify for the playoffs. Ulysses can clinch the district title with a home win over an injury-riddled Wellington team. Should the Crusaders win, they can be district champions if Rose Hill defeats Mulvane. If Mulvane, Wellington, and Ulysses all tie at 2-1, the points system will decide both playoff spots. Rose Hill must beat Mulvane by at least 18 points and hope for a big Ulysses win over Wellington to have a shot at the runner-up spot. District 8 – This is one of the more competitive districts in the state and it will all come down to this week. McPherson can clinch the district title with a win over Hays. Hays must beat McPherson by at least 17 points to ensure a playoff spot. However, the Indians can win the district title with a win and a Buhler loss to Abilene. A Buhler win guarantees the defending state champions a chance to defend their title. Abliene must beat Buhler by at least 16 points and hope for a Hays loss to McPherson in order to qualify as the runner-up. District 1 – Holton has clinched the District 1 title by beating Perry-Lecompton (56-27) and Jefferson West (38-6). The Kaws and Tigers will settle the runner-up spot in Meriden this week. District 2 – Santa Fe Trail will travel to Osawatomie this week to decide both playoff spots. The winner is the District 2 champion, while the loser will travel to Holton in the first round. District 3 – Girard has clinched a playoff spot as the Trojans can finish no worse than second in the district points tie-breaker should they end in a three-way tie for first with Iola and Burlington. Anderson County is eliminated because the Bulldogs cannot finish with the most district points should they end in a tie with Burlington and Iola at 1-2. Girard clinches the district title with a win over Iola. Burlington clinches a playoff spot with a win and an Iola loss to Girard. District 4 – Frontenac and Columbus will be heavy favorites to win this week and secure the two spots. The Raiders can clinch the district title with a win over Baxter Springs. Baxter Springs would need to beat Frontenac by 20 or more points to make the playoffs. Columbus can clinch a playoff spot with a win. Parsons has been eliminated because even a 21-point Viking win combined with a Baxter Springs loss would get Parsons the most district points among the 1-2 teams. District 5 – Andale has clinched the district championship with wins over Wichita Trinity and Clearwater. Trinity will travel to Clearwater this week with the winner advancing to the playoffs as the district runner-up. District 6 – Wamego is the district champion with wins over Chapman (20-6) and Smoky Valley (35-14). Chapman will travel to Lindsborg to take on Smoky Valley this week with the winner advancing as the district runner-up. District 7 – All four teams are still alive for a playoff spot. Concordia can win the district title with a win over Clay Center. Clay Center is the district champion with a win and a Colby loss to Goodland. Goodland needs a win over Colby and a Clay Center loss to have a chance. District 8 – Holcomb has clinched a playoff spot because even with a 21-point loss to Hugoton and a Pratt win, the Longhorns would finish in the top two in the district points tie-breaker. Hugoton can win the district title by beating Holcomb as long as Pratt loses to Larned. Speaking of Larned, the Indians can get in with at least a 15-point win over Pratt and a Hugoton loss to Holcomb.